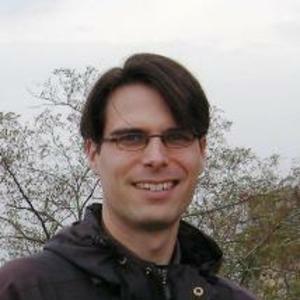 My main research interest is in evolutionary genomics, ecology and conservation biology. The focus is mainly on genetic variation important in and ecological and conservation biology context. I also work with more applied conservation biology issues. Natural selection may rapidly lead to local adaptation in genetically structured populations of threatened and administrated species. Investigators trying to find specific genetic variation important for conservation of such populations in non-model organisms have previously been restricted to using a small number of anonymous genetic markers or variation in a few candidate genes. With the advent of high throughput sequencing and genotyping it has now, for the first time, become possible to identify adaptive genetic variation at a genome wide scale. We will present data from a whole genome sequencing project and large scale genetic variation profiling of a mammalian predator, the wolverine (Gulo gulo). Scandinavian wolverine populations are subjected to habitat fragmentation and high mortality from poaching due to conflicts with livestock herders. Genetic monitoring is already an important part of the national conservation programmes for this species in Sweden and Norway but the resolution and applications of genetic data have been hampered by a lack of genomic information. By assembling the complete wolverine genome and characterising genome wide genetic variation by re-sequencing of several different individuals, we now take this system to a new level. We describe how these novel genomic resources are utilised to investigate genomic signatures of population subdivision, reconstruct kin structure and to infer effects of inbreeding depression in small and partially isolated populations. We also discuss how the insights gained from this project will be applied to practical conservation efforts and monitoring of this highly charismatic species in the Scandinavian countries. Sexual selection is a key area in evolutionary biology, explaining the evolution of seemingly maladaptive traits such as conspicuous mating behaviour. Great snipe (Gallinago media) males aggregate on leks, visited by females for the sole purpose of mating, creating the prospect for intense sexual selection. However, the molecular basis of sexual selection in this species is still unknown. 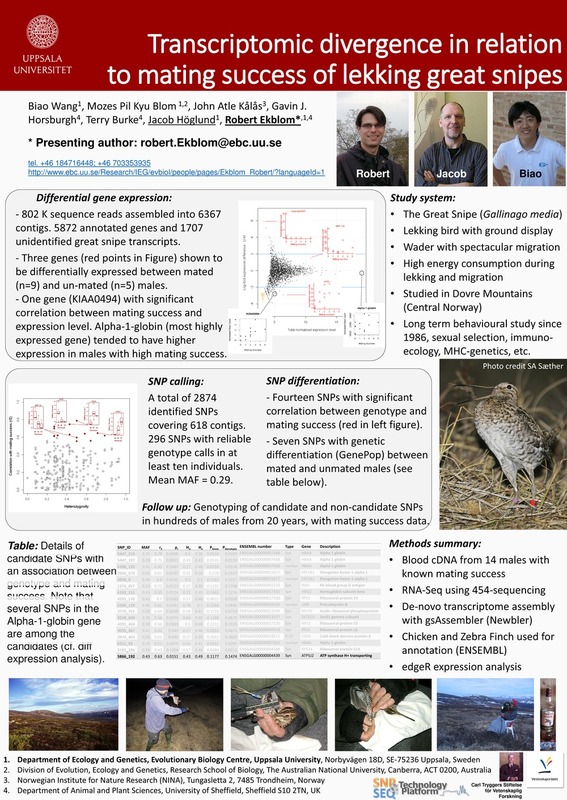 In this study, we sequenced the blood transcriptomes of 14 male great snipe individuals with different mating success to identify genes that might be related to sexual selection. One full 454 FLX Titanium run with individually tagged samples was used, and the de-novo assembly of the great snipe transcriptome using all the data consisted of 4476 transcripts (isotigs) with average length of 896 bp, together with 153431 high-quality singletons. 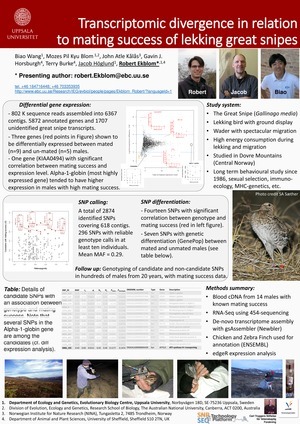 The great snipe transcripts were homologous with 4900 chicken genes and 4853 zebra finch genes. Differential gene expression analyses were performed by comparing the sequencing read counts between the mated (9) and unmated (5) individuals, which allowed us to identify 4 differentially expressed genes. In addition, we also identified 2874 single nucleotide polymorphisms (SNPs) and compared the SNP genotype variation between the mated and unmated groups, which led to the identification of 18 genetically structured SNP loci. The functions of differentially expressed genes included ‘oxygen transport’ and ‘viral RNA degradation’. Interestingly, the gene coding for alpha-1-globin was identified as a candidate for both differential expression and for nucleotide divergence. To establish functional correlations between the candidate loci and the ecological variation, these candidate genes need further investigation. To this end, we provide a large number of functional genetic markers (SNPs and SSRs) that can be utilised in follow-up studies.